(Dover NH – April 4, 2018) – A Very Hungry Caterpillar, an adorable insect with an insatiable appetite, will be visiting the Children’s Museum of New Hampshire this weekend, Saturday, April 7 from 10am-2pm. This larger-than-life caterpillar, created by author and illustrator Eric Carle, has inspired generations of kids. 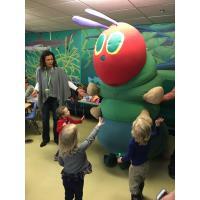 The caterpillar will be visiting as part of the museum’s Books Alive program, which seeks to make reading a regular family experience. As the large, friendly costumed caterpillar looks on, museum educators read stories. Then it’s time to line up for hugs, high fives and photos with the happy critter. There will also be a variety of caterpillar-inspired literacy, math and creative activities for all guests. The costumed caterpillar will be out in the museum for storytimes and photos at these times: 10:30am, 11:30am, 12:30pm and 1:30pm. He will be gone from the building by 2pm. Books Alive is sponsored by TD Charitable Foundation, Cogswell Benevolent Trust and Exeter Hospital, Inc.
First published in 1969, The Very Hungry Caterpillar features a caterpillar who eats its way through a wide variety of foodstuffs before pupating and emerging as a butterfly. Eric Carle’s colorful and distinctive collage illustrations have captivated young audiences for many generations. As the caterpillar “eats holes” in the pages, kids can count the days of the week and food, and learn about a butterfly’s life stages. This beloved story is even endorsed by the Royal Entomological Society for its portrayal of the life stages and transformations of a caterpillar to a butterfly. The Very Hungry Caterpillar has been translated into more than 62 languages and sold more than 46 million copies. Eric Carle is a designer, illustrator and writer of more than 70 children’s books, and the founder of the Eric Carle Museum of Picture Book Art in Amherst, MA. All Books Alive activities are included with regular paid admission to the museum: $10 for adults and children over the age of 1 and $9 for seniors. Museum admission is free for Children’s Museum of NH members and children under 1 year old. To learn more visit www.childrens-museum.org.